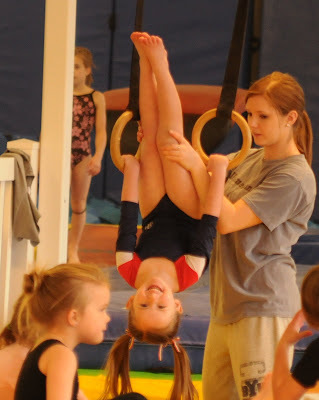 Singing and Spinning: Ivy a gymnast? There was once a time when Ivy was taking dance and Jade was just doing gymnastics. While Jade would watch Ivy, she started to long for a dance class. We got her enrolled. 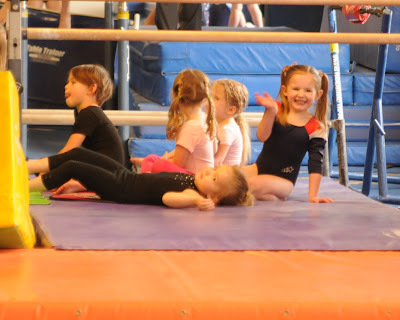 Ivy has watched Jade at gymnastics for 3 years now and has never wanted to participate, until recently. Luckily, we only had to wait on the waiting list for about a month and a half. (We needed Ivy to have gym at the same time as Jade- it was the only way we could make it work). 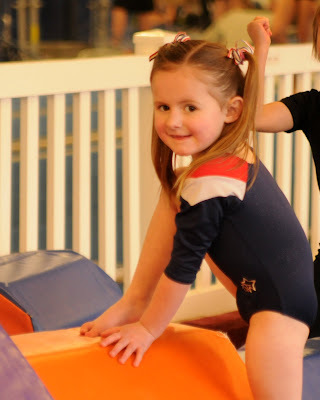 From the moment Ivy found out she got to start gymnastics, she's been talking about it to everyone and planning with Jade just how they would say "hello" during their classes. The day finally came that Ivy got to start. It was every bit as wonderful as she had hoped. Jade would yell and wave as she would walk by Ivy's class and Ivy would wave at anyone that was willing to look at her. 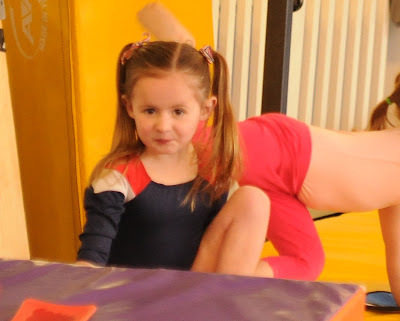 Yes, I was the obnoxious mom with a camera shooting pictures of her first day of gymnastics. But really, how could I not? She was posing constantly and would look over at me for approval any time she got a chance. Her cartwheels are actually starting to resemble cartwheels. Crazy! after one day with their cool cartwheel mat and she's starting to get it. Of course, if you ask her, her cartwheels are "perfect" and she gets her legs "way up high" and there is NO arguing with her about it. That is too cute! Love the pigtails.